Most readers have likely heard that President Donald Trump is claiming that the U.S. military is “depleted” and is calling for a major boost in the Pentagon budget. 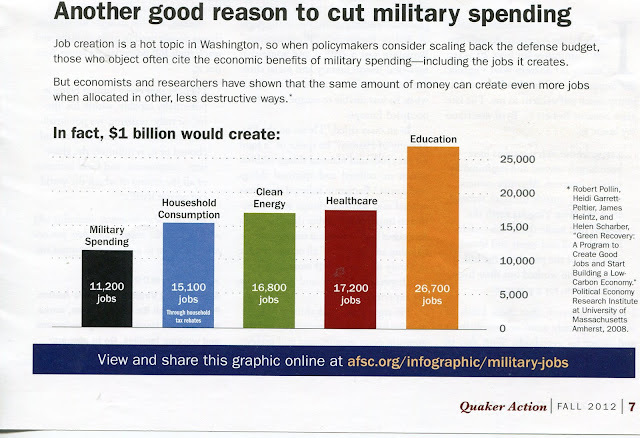 In his February 28 address to Congress he promised to send “the Congress a budget that rebuilds the military . . .” He’s also indicated that he plans to pay for the increase by cutting domestic spending, although it is not yet clear where he would find the additional $54 billion he’s planning to spend, this year alone. While there has been some pushback and some questioning whether the increase is needed, few sources we’ve seen have focused in on or deconstructed the depletion narrative, which seems to be wholly invented by Trump to justify doling out our tax dollars to leading firms in the Military Industrial Complex. More importantly, from our perspective, there has been little serious analysis of the assumptions behind the U.S. spending as much as we already do on the military. As the mainstream media rarely lets this cat out of the bag, perhaps you’ve not heard that the U.S. spends more than the next seven countries with super-sized military budgets, combined. And you might not realize that most of those seven are U.S. allies or countries with which our government has friendly relations. You might have also missed the fact that so-called “rogue states,” like Iran and North Korea are way down the list with miniscule military spending compared with any of these big spenders. All this begs the question, “Why”? Given that the U.S. has generally friendly relations with our neighbors to the north and south, and that we have rather large oceans on our east and west, why are we spending so much? The countries and sub-national groups the U.S. military has been sent to fight in recent years are third tier powers, at best. The reality is, despite the constant attempts to instill fear, the U.S. faces no serious and credible military threat. Indeed, with just 4.5 percent of the world’s population, why is our government, without serious enemies, responsible for more than one-third of the world’s military spending? How can they justify spending as much as they do already, let alone spending hundreds of billions more over the next decade? Well, words have power and perhaps a key to unlocking this mystery is to consider that those in government and most of the mainstream media refer to military spending as the “Defense Budget,” when, in fact, it has very little to do with defending our nation. What was once called the “War Department” was, in classic Orwellian Doublespeak, renamed the “Department of Defense” after World War II, at a time when global hegemony was thoroughly embraced by the corporate elites, and the United States dramatically increased its frequency of interventions, and took them global. In previous eras the U.S. mainly invaded countries and conducted covert ops in Latin America. After WWII, with older empires crumbling, the whole world became their playground. The U.S. military was globally dominant. It occupied Western Europe and faced off against the Soviet bloc there as well as in Korea/Northeast Asia. It toppled governments and propped up military juntas and autocratic regimes in Latin America, Africa, the Middle East, Southeast Asia, etc. In the ensuing decades, under the guise of “fighting Communism” the U.S. military and the intelligence complex were responsible for the deaths of many millions of innocent people, including approximately four million in Vietnam/Indochina alone. It seems the nation’s foreign and military policies were, despite President Eisenhower’s warnings, captured by the Military Industrial Complex. So, when the Soviet Union and the Warsaw Pact evaporated in the late 1980s, there was only a scant “Peace Dividend.” Military spending remained off the charts, compared with any other nation. Under Bush Sr. and Clinton, the U.S. military continued to be based and to operate as the dominant power on virtually every continent, every ocean, in the skies above and even in outer space. The military is big on naming things, be it operations, strategies, etc. The term they embraced for their strategic posture was “Full Spectrum Dominance.” This is essentially the notion that whatever theater of operations they might be involved—from local skirmish to global war—anywhere in the world, they seek to have the edge over any and all adversaries, real or potential. 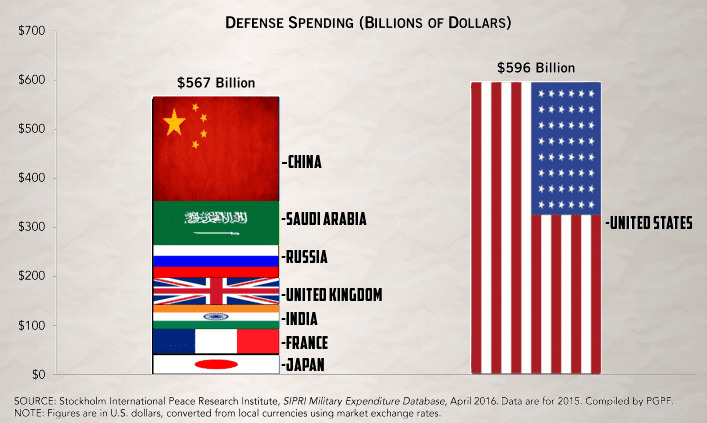 Some proponents of massive military spending point to the fact that the U.S. has a huge economy and thus can afford to spend a lot. What they don't address is that the U.S. not only spend far more in total than any other nation, but also spends a much larger percentage of out GDP than most affluent countries. 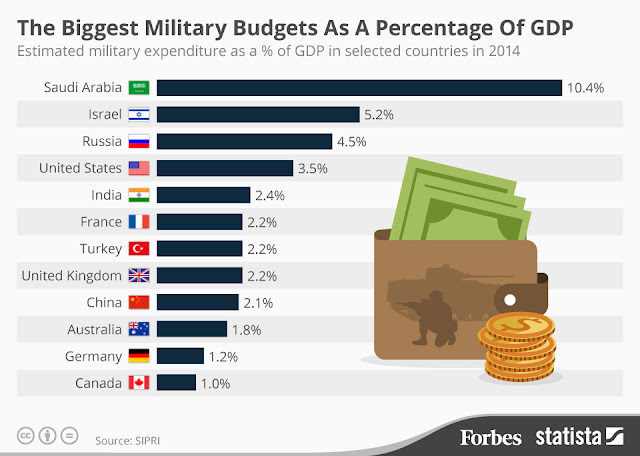 Those wasting less on wars and militarism have, in general, healthier economies than ours. The horrible crimes of 9/11 were a godsend to military contractors, as they were used to justify the Afghan War, the Iraq War and ultimately operations in dozens of countries around the world. In reality, a handful of extremists in caves in Afghanistan, or some of their minions bearing only box-cutters as weapons don’t constitute a serious military threat. But invading, bombing, occupying, incarcerating and more succeeded in manufacturing far more “enemies” than there were back in 2001. And this has been used, over and over again, to instill fear in our people and to gin-up support for more militarism and more military spending. It is just this sort of fear mongering that leads people to support squandering billions upon billions on weapons we don’t need; weapons that will not make us any safer; weapons that are redundant and have a huge opportunity cost. Might we not do well to consider the notion attributed to Mark Twain that “If your only tool is a hammer then every problem looks like a nail?” Shouldn’t we be looking to diversify our tool box? We invite you to join us in a little “thinking outside the box.” What if, instead of major increases in military spending, our government was to pursue significant cuts the Pentagon’s bloated budget and redirect the funds into efforts that would actually enhance our security. After seven decades of being on a permanent wartime footing, this is, indeed, a radical notion, but one we’d do well to seriously entertain. Instead of more weapons, we could invest in sustainable development around the world addressing some of the root causes of conflict. The USA could lead the way in moving the world toward a secure, peaceful, just and sustainable future. We could invest in efficiency and clean energy to address the climate crisis, which threatens everyone’s future. We could make investments at home, in our people and our infrastructure, making our economy stronger and more resilient. The only losers in this process would be those who today profit handsomely from selling us the means of death and destruction and those who profit politically from the marketing of fear. This transition should not be unilateral. Our government could engage the nations of the world to push for international agreements for mutual, verifiable cuts in armaments and military spending, done incrementally over the coming decade. We could announce a new foreign policy based upon cooperation and collaboration to address the very real problems humanity faces in the Twenty-first Century. The United States could challenge the nations of the world not to a new arms race, but rather to a race to creating just, sustainable societies. Instead of being an object of resentment and ridicule, as it is today, the USA could truly serve as a beacon of hope, a force for good in the world. We are not so naïve as to believe that such a transformation—needed as it is—is imminent, but it must be our aspiration. And we must communicate such a vision to elected officials and candidates for office who hope to win the support of progressive, caring citizens. We must also remind those who supposedly represent us that military spending creates fewer jobs per dollar spent than almost any other spending category. The need for a clear notion of where we are and where we need to be headed has been recognized for millennia. As it says in the Biblical Book of Proverbs, “Where there is no vision, the people perish.” It’s up to us to articulate a clear vision, to amplify it and to insist that, as far off is its full implementation might seem, that we be moving in that direction. Your participation in this process is essential. A Permanent War Economy is not a healthy economy. We need to take this message to our elected officials.